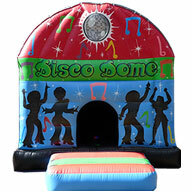 Disco dome hire Manchester, Stockport, Wythenshawe, Cheadle, Salford, Denton and surrounding areas. 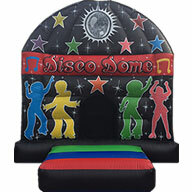 Disco dome are a popular inflatable as it offers more fun and excitement compared to a standard Bouncy Castle. The new disco dome is different from the older Dome/Moonwalk styles as they stay inflated even without a door. They are the perfect addition to any party as they have funky colours and themes to suite boy or girl. Make your party pod/disco dome come to life with Bluetooth speakers and flashing lights . Simply connect your smart phone, iPad, iPod or any other bluetooth device and play your own choice of music! Disco dome hire in Manchester and the surrounding area has demonstrated extremely popular and to keep up with demand we have more than one.